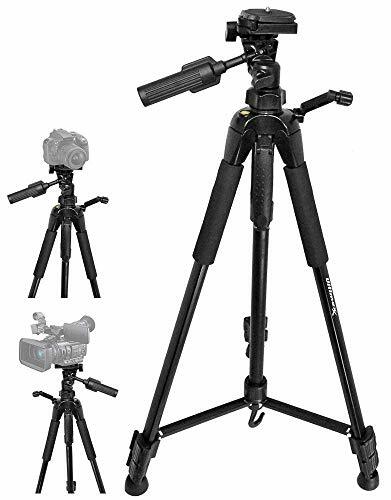 -- Tripod Max height: 70"
-- Tripod Min Height: 21"
-- Monopod Max Height: 65"
-- Dimension of tripod when completely folded: 22.4"
2-in-1 Aluminum Tripod & Monopod: Adjustable Center Column Converts to 4-Section 21"-70" Tripod and 5-Section 18"-65" Monopod. 3.63 lbs Net weight; 8.8 lbs Load Capacity. Foldable Feature for Travel. 3-Way Flexible Pan and Tilt Head: Provide 360 Rotation Panoramas; Built-in Bubble View Levels. Quick-Release Plate with Standard 1/4-20 Screw Mount Compatible for all DSLRs, Digital Cameras, Mirrorless Camera, Lenses, most Camcorders, GoPro devices, Binocular, Telescopes. 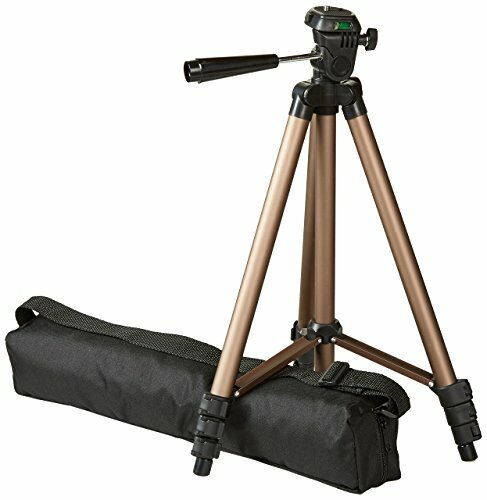 360 Telescopic Pan Handle; Large Handle for Carrying Conveniently; Flip-Locks for Leg Height Adjustment; knobs & Non-slip Pongee/Rubber Mats for Strong Stability; Center column hook for Hanging Additional Accessories/Adding Weight to the Tripod for Additional Stabilization.A Carrying Bag & Gift Box is Included. 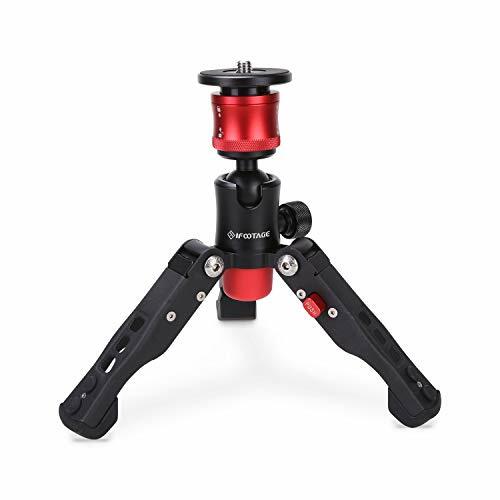 Universal Phone Holder Tripod Adapter is included: Rotates Vertical and Horizontal, Adjustable Clamp. Mobile Phone Clip Size: 2.28-3.97, International Standard Screws 1/4 Interface. 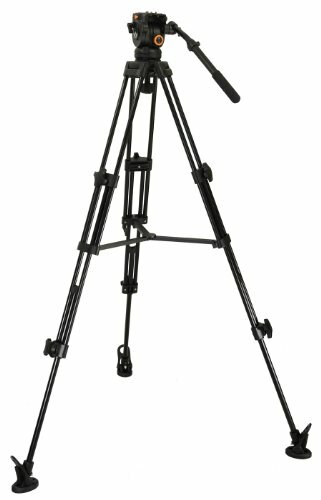 Professional Camera Tripod: Adjustable Center Column Converts to 3-Section 22"-64" Tripod. 2.75 lbs Net weight; 6.61 lbs Load Capacity. Foldable Feature for Travel. 180 Tilt Handle;Acial Lifting Hand Crank; Flip-Locks for Leg Height Adjustment; knobs & Non-slip Pongee/Rubber Mats for Strong Stability; Center column hook for Hanging Additional Accessories/Adding Weight to the Tripod for Additional Stabilization.A Carrying Bag & Gift Box is Included. ESDDI specializes in the production of lighting equipment such as lighting kits, camera tripods, lighting lampholders lens pouch and other accessories. YoTilon - Committing to give you a better and assured online shopping experience! 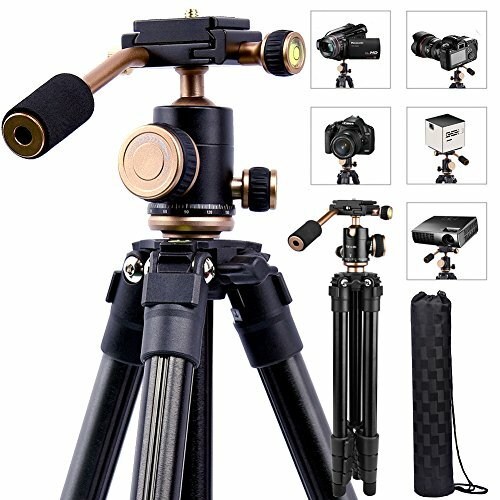 Features: Lightweight(0.94kg) and compact with carry bag Height adjustable from 405mm(17in) to 1240mm(49in) Strong and flip-type leg locks, easy and convenient to operate with one hand 360 panorama fluid ball head, ideal for multi-angle and travel shooting Standard 1/4 screw tripod compatible with all DSLR Cameras Quick release plate,convenient to use Spring Loaded Hook hanging additional weight to enhance stability Compatible with Canon, Nikon,Fuji, Sony,DV, camcorders, Micro Projector, Samsung, Panasonic, Video and so on. High quality material making the tripod strong and durable. The center column can be inverted to achieve macro shooting and special photography. Specifications: Brand: Yotilon Material Of Tube and Ball Head: Aluminium Maximum Height: 1240mm(49in) Minimum Height: 390mm(15in) Folded Height: 405mm(16in) Item Weight: 0.94kg(2.07lbs) Lock Style: flip-type Suggested Load Capacity: 3kg(7lbs) Leg Sections: 4 Inverted:Yes Purpose: travel, trip, hiking, outdoor activities, indoor activities and so on. Ball-head: Ball Head: 360 Degree Panorama Ball Head Quick Release Plate: Yes Panning Range: 360 Degree Bubble Level: Yes Screw: 1/4 and 3/8 inch (ball head removed) Tilt Range: -45 /+90 Panning Lock: Yes In the box: 1 x Compact Tripod 1 x Allen Wrench 1 x Quick Release Plate 1 x 1/4" Standard Screw 1 x Tripod Carrying Bag 1 x Manual Warranty: Warranty And Spring Loaded Hook: We promise 30 days full refund without return guarantee (limited one piece for one customer) and 12 months worry-free warranty please feel free to order. Allow to hang additional weight from the tripod's center for enhanced stability making your shoot more sturdy and perfect. Quick Release Plate And Wide Compatible: Quick release plate with 1/4 screw, compatible with all dslr slr camera,camcorder,mini projector,digital cameras.For example,Nikon d3400 d3300,d3400,d5300,d7000,canon 7d,canon rebel,sony a7,sony a6000,sony a7iii And so on, so its a canon tripod, nikon tripod and sony tripod. Lightweight Compact And Three Angle Positions :The weight of the tripod is only 2.1 lbs(0.94kg). 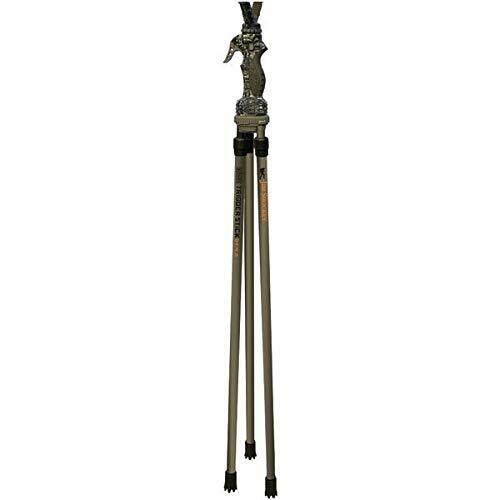 The height is adjustable from 405mm(15.9in) to 1240mm(49in), perfect for business travel, outdoor adventures, indoor activities or family trips with carry bag for easy portability and safe storage.Three angle positions of the leg enable shooting on cramped quarters or on uneven rough ground. 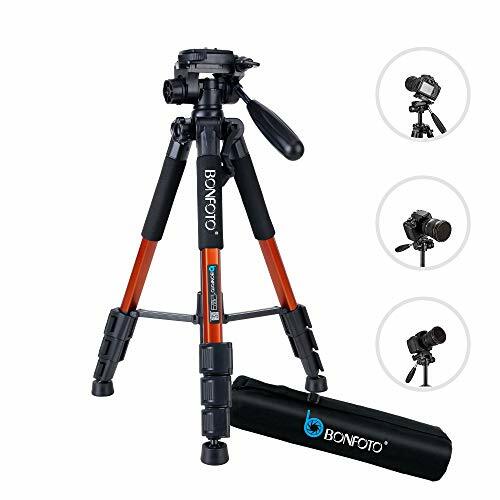 Panorama Ball Head And Inverted Column: This camera tripod equips 360 degree pan ball head and bubble fluid level indicator on the tripod, ideal for travel and work professional shooting. This professional stand can be inverted to achieve macro shooting and special photography.its a great tripod for your nikon canon and sony dlsr slr camera. Quick Leg Lock and operation Handle: Equipped with extra strong quick buckle leg locks and operation handle, very easy and convenient to extend and fold. The recommended loading capacity is 3kg or 6lbs the max capacity is 5kg or 11lbs. Spring Loaded Hook And Warranty: Allow to hang additional weight from the tripod's center for enhanced stability making your shoot more sturdy and perfect. We promise 12 months worry-free warranty and 30 days money back guarantee please feel free to order. 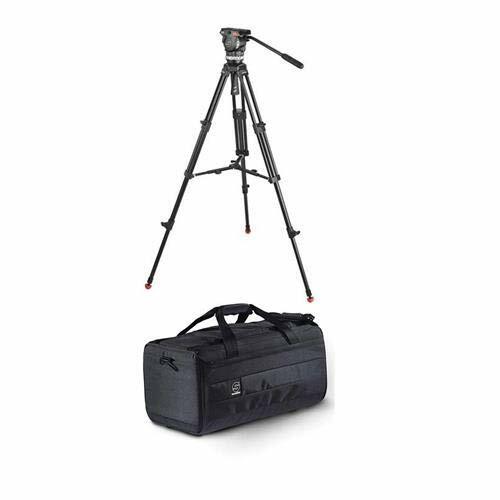 The Cayer BV30 Professional Tripod System includes the BV30 Aluminum Tripod and K3a Fluid Head with Carrying Bag. 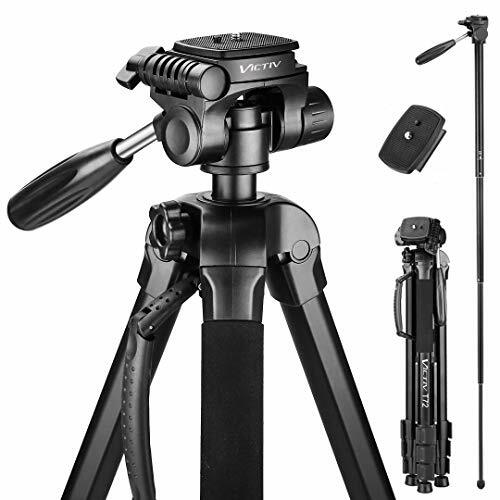 Capable of supporting up to 13.2 lb, the BV30 provides a professional tripod system solution. 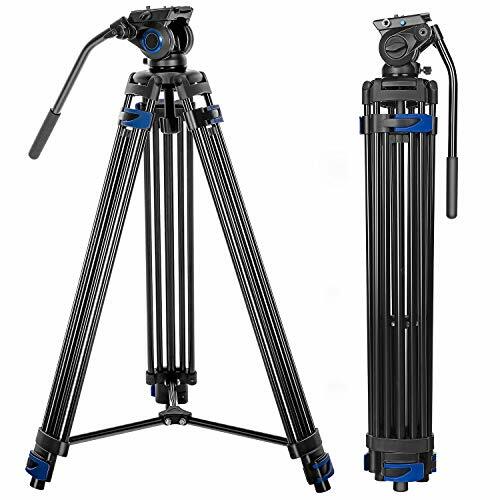 - 2-stage 3-section leg design allows you to adjust the height of the tripod from 32" to 64"
24 hours email reply guaranteed! 24 months free replacement warranty for manufacturer's defects! 1. How to detach the pan head from tripod and install other ball head? tripod. The screw that connects the tripod and pan head is 1/4-in. screw to 3/8-in. Finally other ball head (3/8-in screw-hole) can be installed to the tripod. 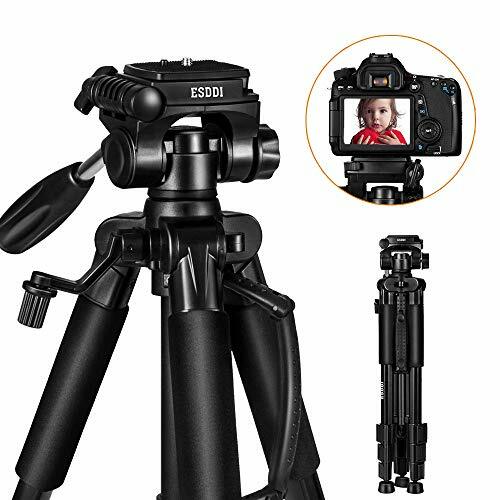 Height Adjustment Range 21" to 72"
ADD SOME PERSPECTIVE - From low angle shots to landscape views, you need a DSLR camera tripod that'll help you capture the perfect photo. Get a tripod with perspective! 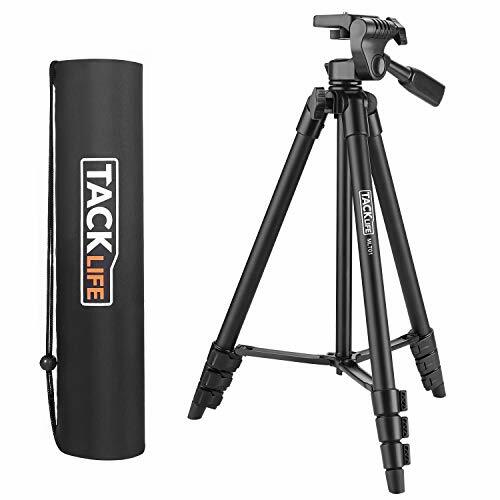 This tripod gets as low as 14.5" and as tall as 56", giving you the best angle for every shot! 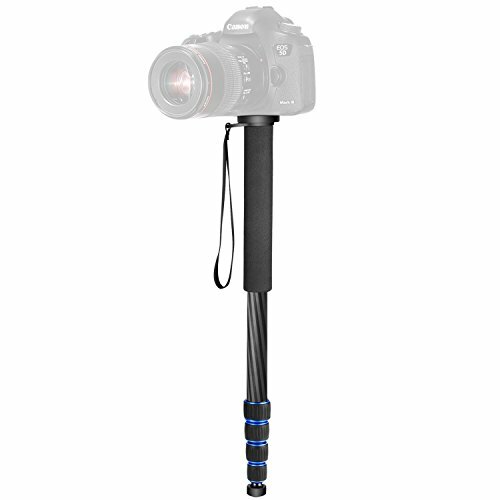 Plus, it converts into a monopod for even more still and video versatility. PICTURES MADE PORTABLE - Heavy camera supplies are a hassle, especially when you're on the road! But this Sturdy Tiger camera stand tripod is perfectly portable. Your aluminum travel tripod easily folds into a compact package and weighs a feathery 3.5lbs. 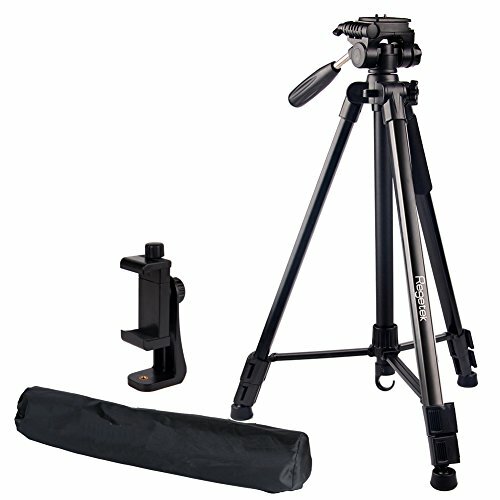 STABLE SETUP - Make sure your camera is safe, secure, and stable with a steady stand. Our tripod for DSLR cameras has legs that lock, and can hold up to 8ibs, keeping your valuable equipment safe and your photos crystal clear. 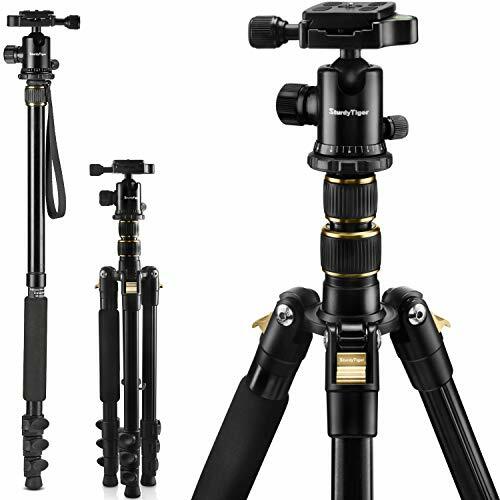 PANORAMIC POSSIBILITIES - Turn your visions into reality with the right still and video tripod! The 360-degree ball head expands your camera's capability while shooting in panoramic, from distances, unusual angles, and more. Compatible With: Canon, Nikon, Sony, Olympus, Leica, Fujifilm, Pentax, Lumix and more. PUTTING YOU FIRST - When it comes to your camera accessories, you expect a lot. At Sturdy Tiger, we take pride in the quality of our products. Your photography tripod comes with our unbeatable 1-Year Warranty, so you can purchase with confidence! Warranty: We believe in our products. Provide you a 24-month warranty and friendly, easy-to-reach customer service support. Compatible with Canon Nikon Pentax Sony Fuji Lumix Olympus DSLR and Video Camcorder through reversible 1/4inch-3/8inch screw on the mounting plate, can be adjusted from 1/4inch-3/8inch by unlocking the plate and put the screw upside down. Carbon Fiber constructions, light weight and durable, designed for stabilizing your equipment in different occasions. Can also be converted as alpenstock if needed. 5 leg sections with twist locks anti-rotation system to offer an adjustable height from 18.9 inches/48 centimeters to 64.2 inches/163 centimeters. Non-slip foam rounded handgrip and wrist strap ensure a safe hold and avoid risk of camera dropping. Except the non-slip rubber for flat ground, it also comes with a screw-in metal spike for easy installation and enhances stability on dirt, grass, and other uneven terrains. 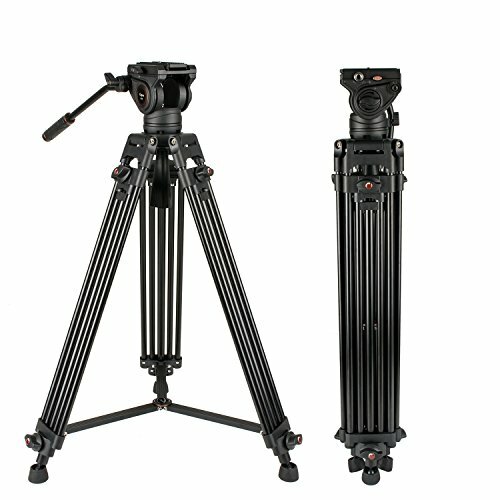 The EK60 series professional tripods system includes EK40 series tripod, EH6 series fluid drag head. EK6 series fluid head offers 3 steps counterbalance; silky-smooth fixed, 1, 2, or 3 steps tilt and pan fluid drag adjust(According head model), and a convenient, industry-standard 75mm leveling ball. 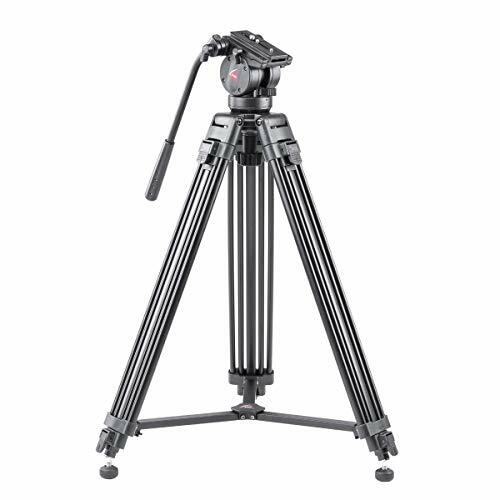 The Sachtler 1001 System Ace M MS Head is a full tripod system for videographers who use HDSLR cameras and smaller camcorders. Whether you're doing documentaries, ENG, weddings, corporate videos, or any other type of projects with a smaller camera, the Ace system matches your needs, enabling broadcast-style performance with lightweight components. With its light weight, compact size and mid-level spreader, this system is perfect for projects that involve multiple setup changes on unpredictable surfaces.With a payload up to 8.8 lb, the Ace fluid head features five steps of counterbalance as well as a plate that features a 4.1" range of adjustment, so you can balance your small camera to a very precise degree. Designed by Sachtler engineers for the Ace head, the SA drag system enables smooth, precise panning and tilting via the head's pan bar, with three grades of drag in both the horizontal and vertical dimensions, plus the option of zero drag. The head's tilt range is +90deg. to -75deg. .The tripod mounts the head via its 75mm bowl. With the Ace head attached, the two-stage aluminum model reaches a maximum height of 66.5" for a comfortable working height for almost all users. Also included is a mid-level which adds to the stability of the system on any surface, indoors or out. Non-Slip Rubber Feet: Aluminium alloy legs which include three flip locks for adjusting the size of each leg, which works great outdoor on uneven surfaces. Fully Adjustable Locking Legs: The tripod's legs can extend from 25.5 to 72. Leg locks release smoothly and glide easily to your desired height. Quick-release mounting plate to ensure fast transitions between shots; compatible with most digital cameras, video cameras, GoPro devices. 3.If you have any query about us or the products, we will solve your problem paiently at any time. - Leg angle adjustment lock ensures single adjustment of each leg. - 4-section column leg with quick release locks, giving a more convenient leg handling, satisfying your wanted height when shooting. - The center axis inverted function ensures you lowest shooting. - Equip with steel rocker, you can adjust the ball head during the shooting. - Design a handle to lift the axis, more convenient to use. - A portable pocket makes it easy to carry. - Best choice for SLR camera in your travel. Warranty Our products only contain tripod and phone holder mount, other accessories, if you need,you can buy by yourself.We promise 45 days money back guarantee; One year warranty and 24-hr customer service provided from ZOMEI. 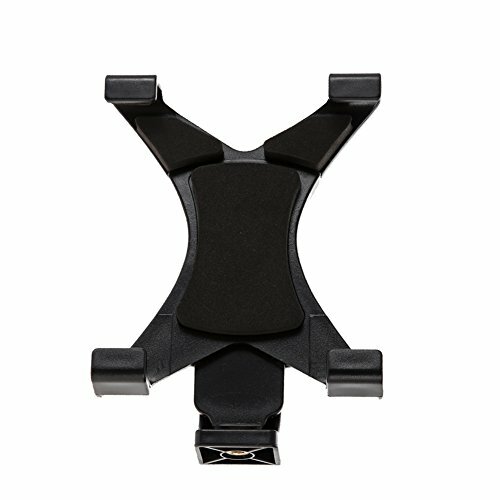 This IFOOTAGE mini table tripod is professional for DSLR camera, video or camcorder, also suitable for mobile phones, action cameras, projectors, portable size to pack, easy attachment with quick release plate , flexible body and safety adjustment knob locks support for different angles or heights shooting. It is the perfect gift for video vlogging on YouTube, video conferencing, travel and daily home video. Portable mini but powerful - 1.27 lbs net weight, 5.9 inch foldable size, max load 17.6 lbs for cameras with larger, heavier lenses. Portable with a convenient carry bag included, best ideal for travel. Pivoting Tripod - Come with a professional ball base enables 360 swiveling, 90 tilting in all directions and allows easy switches from landscape to portrait modes. Quick Lock and Unlock Release - Single hand operation. No buttons, no twisting, just a simple slide down to release and slide up to lock. Adjustable Legs - Simply push, click and lock. Easy to use, set to 3 different angles, 20 , 50 , 78 with adjustable heights of 6.1, 7.87, and 9. Universal Tablet Tripod Mount Clamp can securely mount your tablet and larger phone to a selfie stick or any tripod with 1/4" thread, which allowing you to record video and taking photos with your tablet and larger phone. Just enjoy the fun with your family and friends. 1. It can expand from 12.5cm/4.73" to 20.5cm/7.87", fitting any 7" to 9" diagonal screen size tablet. 3. Support iPad mini in both portrait & landscape orientation, iPad 2/3/4/Air/Air2 in landscape orientation, other tablets and Galaxy Tab 7.0 series in portrait orientation. It is compatible with selfie stick and any standard 1/4 tripod mount. Support iPad mini in both portrait & landscape orientation, iPad 2/3/4/Air/Air2 in landscape orientation, other tablets and Galaxy Tab 7.0 series in portrait orientation. 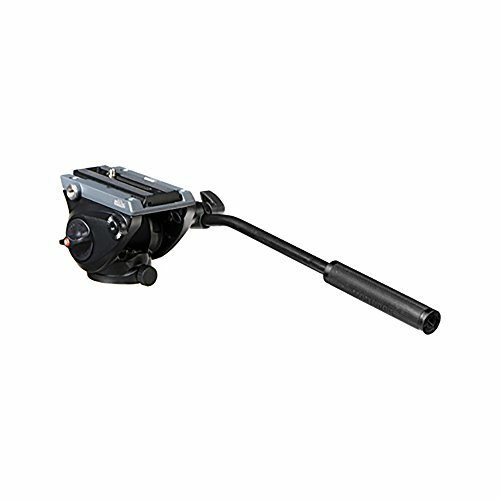 It is equipped with a 3-way head that supports loads up to 6.6 lb and is suitable for both photo and video applications. The head provides pan and tilt control, as well as a horizontally tilting camera platform for switching to 90 portrait orientation. 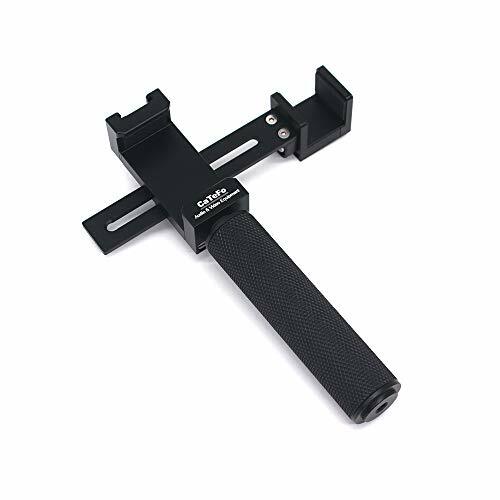 For easy camera attachment and removal a quick-release plate with a standard 1/4" screw . The tripod reaches a maximum height of 57.8" with the center column extended and offers a minimum working height of 17.8". When the center column is removed for monopod use and is fully extended, it reaches a height of 59.8". To allow for use on virtually any surface, the tripod legs features rubber feet . A padded carrying case is included for convenient storage and transport. 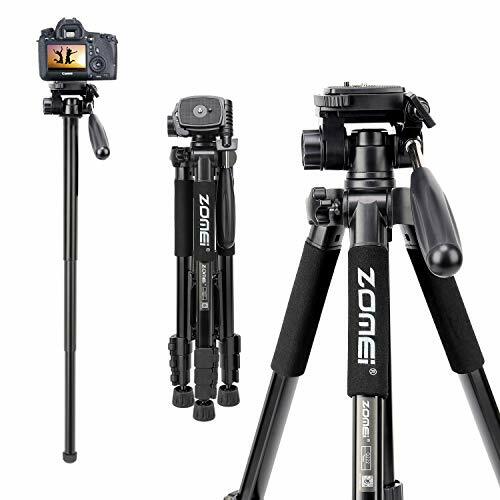 2-in-1 Tripod Can be converted to a monopod in seconds: Loosen the knob and Pull out the center column that the center column can be used as a monopod. Pulls out fast which is great cause sometimes you can get a quick shot. Lightweight and Stable Made of High quality aluminum alloy tube and ABS environmentally friendly materials.The design of the bottom hook which allows you to hang weights and stabilize better. Adjustable With the four-section lever-lock legs, can effortlessly accommodates custom set-ups.It's very useful for most shooting styles and adjusts easily. The 3Pod V3AH is the video tripod of brute strength and stability, boasting an impressive payload of 8.8 lbs. The 3-tiered extendable leg system lets the V3AH reach heights of 61", and features sturdy rubber feet, large, easy to grasp locking knobs, and a torsion resistant aluminum center brace for added strength. CaTeFo CA-OSPH01 video rig kit is unique designed for DJI Osmo Pocket video making with your smartphone, it allows to expand the capabilities with a LED light, a microphone, a tripod, magic arm, and other equipment through the cold shoe interface and 1/4 screw hole expanding OSMO Pocket usage scenarios. All metal construction makes it stable and durable to use. Soft rubber pads inside protect your phone and Osmo Pocket. Also the back slider can be adjusted to fit your smartphone when matching with Osmo Pocket. It is perfect for your film making, video blogging, and traveling recording.